I spoke with a friend and she said that to be Basque means to speak the language, to know people, and to love the land. I would add that it also means to love the food…or at least to love food in general. First, Basque people are Basque because they speak the language. I will write more about the importance of the Basque language in a future post. 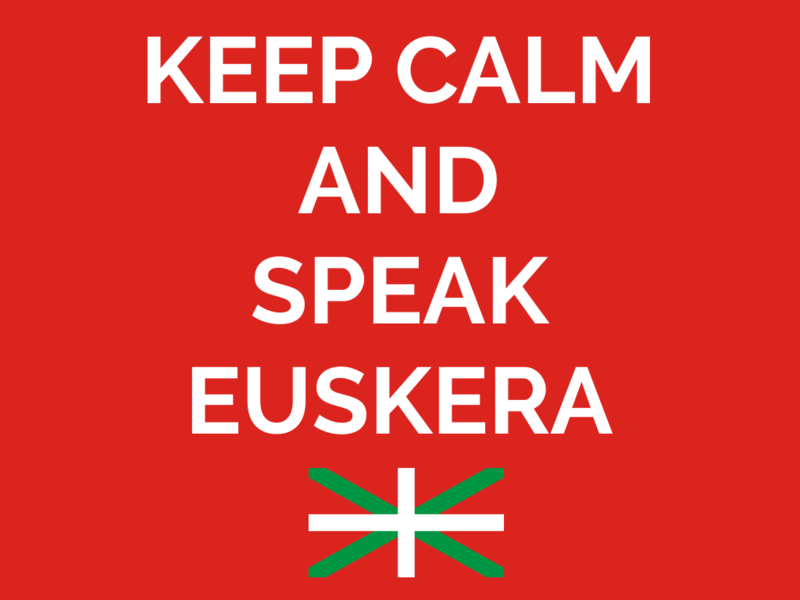 But just know that in the majority of cases, to be Basque means to speak the Basque language (Euskera). OK, we should be honest. Things are complicated in the Basque Country…so not everyone agrees that to be Basque means to speak Basque. There are some people who feel Basque, but only speak Spanish. There are some people who speak Basque, but say that you need to ethnically be Basque. Basque children quickly learn their 8 last names showing how “Basque” they are by how many of the surnames are of Basque origin. Basque heritage is, to their credit, quite unique. Basque people are ethnically different from the rest of Europe (as evidenced by having the highest concentration of type O blood in the world). They have resided in their corner of Europe longer than most other Europeans around them and some people think they may be the last remaining native European people. This of course involves some speculation and some Basque pride. So all you need to know here is that being Basque means something very unique and that the situation can be quite complicated sometimes. Basque people in general have extremely high level of commitment to friends and family. 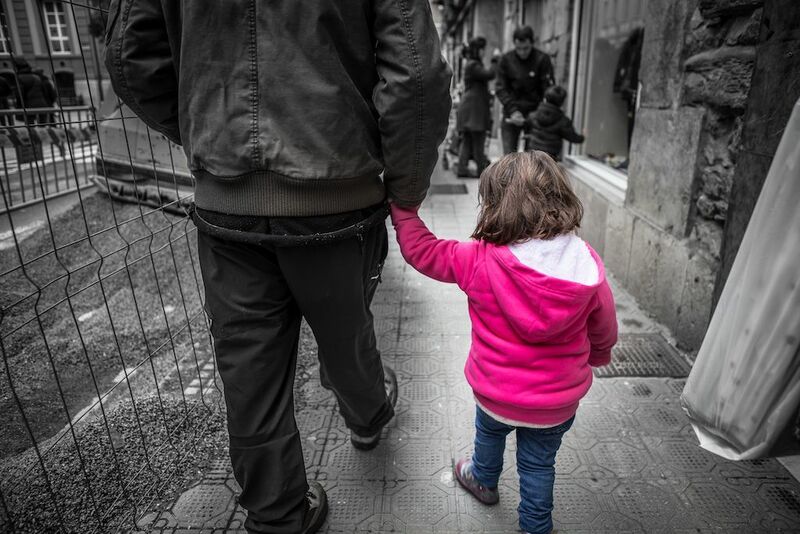 According to EUStat, a Basque government statistics agency, people have a high level of involvement with their families (90% of families describe their relationship with close family as “intense”). Additionally 75% of people describe their relationships with their friends as an “intense” level. Many people have thought that modern society would bring about the destruction of family networks; however, it seems that this is not happening. Families have remained close knit structures and continue to care for one another sometimes on a daily basis. Additionally, children tend to be the center of everyone’s world. Basque children grow up in an extremely lenient environment and yet in an environment in which the entire town raises the child. Children are given a lot of freedom, are always fed first at meals, are spoiled with trips to the candy store on weekends, and always have some sort of snack waiting for them from a parent. Basque people (as you will read later) are extremely hard working, but they also know how to relax and use their free time well. Most people are involved in some sort of sport or activity. Biking, swimming, running, surfing, and mountain hiking are all extremely popular outdoor activities. It is common for people to be on a soccer, basketball, or handball team. And, if nothing else, people like to go for a mile or two walk around their town or on a path after a meal. In addition, there are several sports that are specifically Basque (shown below). Herri kirolak (or town sports) are feats of strength that have their origin in doing farm work (lifting, log cutting, etc). Estropadak (or rowing races) are a unique rowing boat that has its origins from the whaling boats from more than 100 years ago. Towns would have to race to be able to capture a whale when it was spotted before the other towns and sooner than later, rowing races were born. Esku Pelota (or Basque hand ball) has several versions (played with a paddle, your hand, or a big basket) and is best known in the USA as jai alai. But as most places in Europe and around the world, soccer is king. 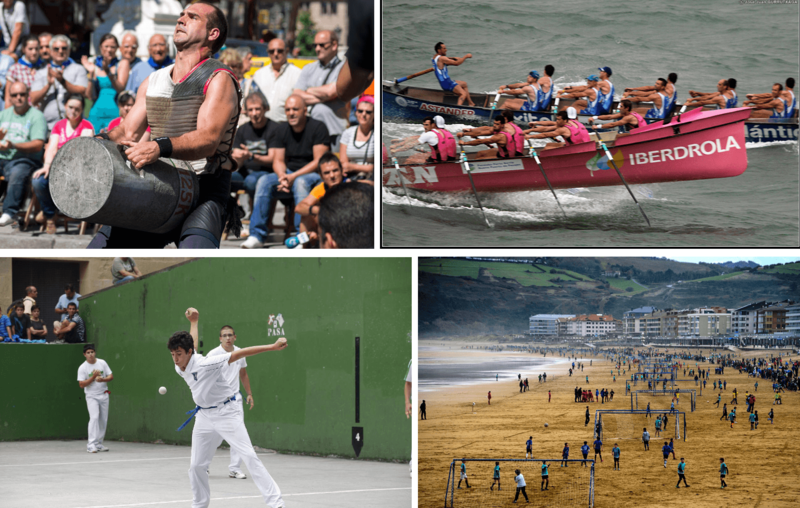 Most weekends in places like Zarautz and Donostia, 30 or 40 soccer fields can be seen setup while children compete in “plaiero” or soccer on the beach. This image is the perfect image for Basque Country…people active in their natural setting and enjoying each other’s company. Like I mentioned above, Basque people know how to use their free time well. And on the weekends, they often use that time to party. Partying among young people can sometimes be at dangerous levels and often young teenagers can be seen drunk in the streets at a festival. But the majority of people simply enjoy a good party, and, for the most part, do it responsibly. They have a word (gaupasa) for an all night party and consider it a badge of honor to be able to get morning coffee when the sun is coming up before heading back home to bed. This may seem excessive to people of other cultures, but many times the party doesn’t even start until 12:30 or 1pm (because dinner doesn’t start until 10pm). Typical food involves a lot of seafood and pork. 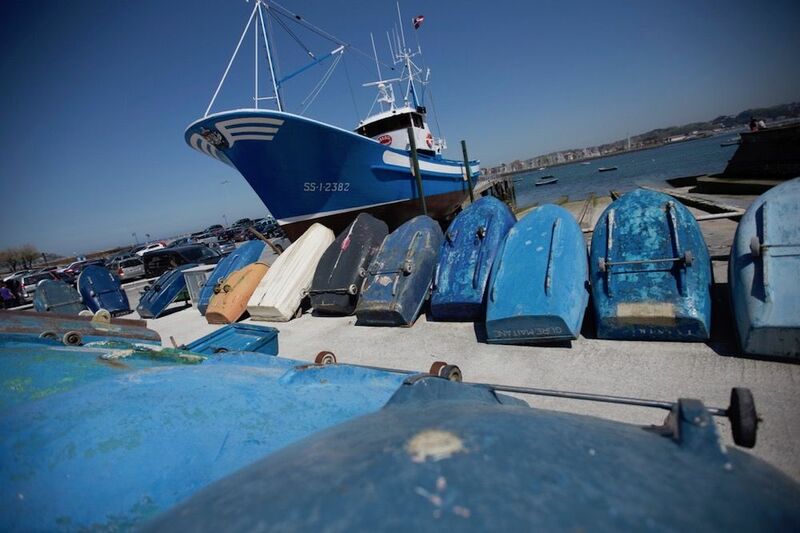 Codfish (Bacalao), hake, shrimp, salmon, and tuna are all very typical seafoods to eat among many others. The Basque make their own style of sausage called chistorra (txistorra in Basque) that is similar to a Spanish chorizo. While there is a lot of Spanish influence in the food, and Spanish omelet (Tortilla de patata) is a staple food, there is definitely a Basque style to cooking. The food here is exceptionally good, but what is more noticeable is how proud people are of it. And not only that, but they enjoy it very much. 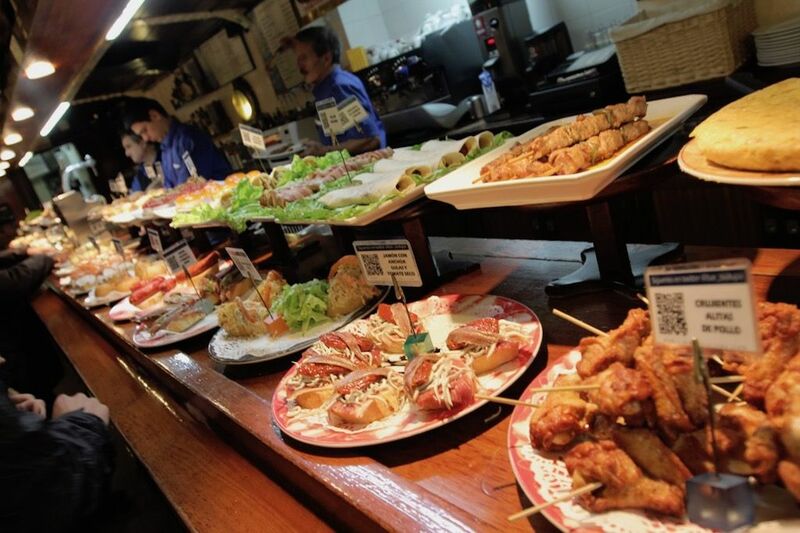 The perfect day for a Basque person probably would involve an appetizer at 11am or 12pm, a big meal from 2pm until 5 or 6pm, a walk around the town with more drinks and some more appetizers, and finally finishing with a small dinner at 10pm. Everything centers around food. 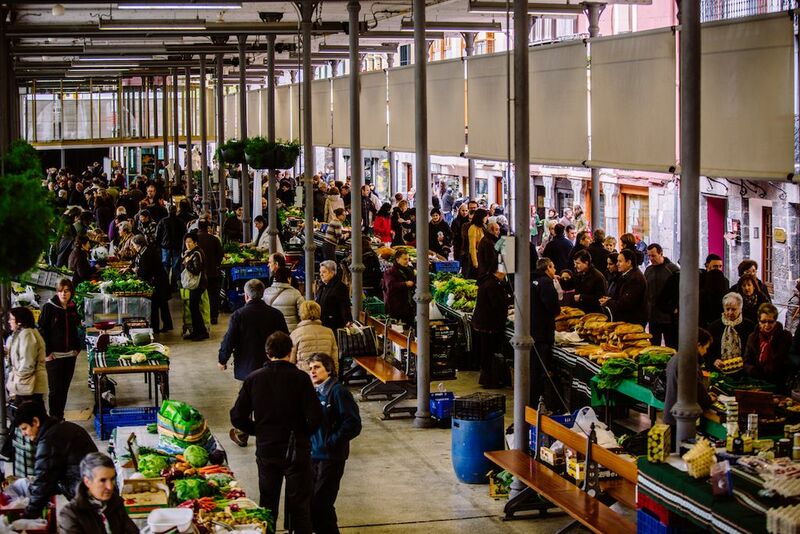 In fact, in the Basque Country many people are owners of “Sociedades” or an eating society. Imagine a restaurant (with a full kitchen, seating area, etc) without the cooks and waiters…that’s a sociedad. People come with their own food, pay a monthly fee to be a member, and pay for the drinks that they use during the evening. The next day the sociedad pays someone to come and clean the kitchen! It’s the perfect way to enjoy good food with friends or family without having the stress of the mess in the house. 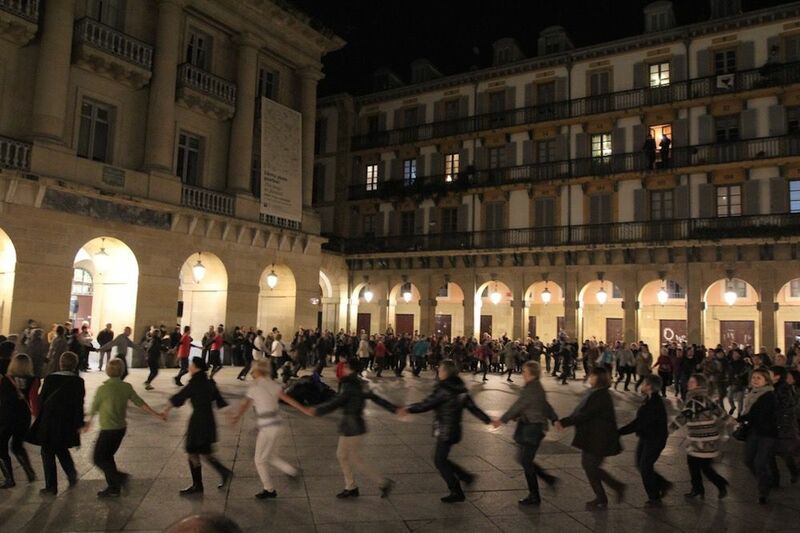 In many ways, Basque culture is founded on extremely old values. Sometimes it feels like the Basque Country is stuck in the 1950s. People still hang out in the street, shop at small local stores, and children walk to and from school on their own. In other ways Basque Country is extremely modern. It is normal to drive along and see a really big factory right next to an old traditional farmhouse. Internet access and cell phone speeds are very good and the standard of living is among the highest in Europe. While most people don’t live on farms or work on a fishing boat any more, there are still many weekly farmers markets that many people shop at. But the same people also shop at grocery stores to buy most of their other weekly produce. Most people live in flats they own in a multiple story building and use a car to drive themselves to and from work. This blend of old and new also lends itself to a very relaxed culture. People very rarely dress up extremely nice and they very rarely dress poorly. Business dress is usually quite casual and there typically are not a lot of pleasantries that are exchanged. The Basque people have had a long history of hard work, industry, and innovation and that tradition continues today. Historically the Basque have been seafarers and fisherman, shepherds, iron workers, and farmers. While some of that continues today, the Basque area continues to be a huge area of industry. While people in the Basque Country take their daily siesta seriously, they can also be found working very diligently on either side of the siesta. For the most part, people are extremely punctual. They are usually not late and they are usually not early. People are on time to work and to meetings, events start usually within 5-10 minutes of start time, and they end promptly. Additionally, they tend to help one another out when work needs to be done. They have an old word that means “neighborhood work” that they would use to describe a community project. Even today often a town will come together to pitch in on work at a school or on a public event. The word of a Basque person has long been considered to be as good as a legal contract. While in modern society contracts are signed more often than they were a long time ago, there is still a strong sense of honor in keeping one’s promises. This also leads to Basque people sometimes being brutally honest about what they think…even if it hurts someone’s feeling. People are polite, but straight and to the point, which can be awkward sometimes for someone from the USA or France for instance. Basque people are extremely well traveled and have an excellent knowledge of the world. They love taking vacations around Europe and do a good job of traveling light and inexpensively. The funny thing is, when they are home, they very rarely go visit another town. Activities at home usually take place within the few miles surrounding their town. In their defense, each town has a lot to offer in terms of hiking, the ocean, and places to be with friends. On the other hand, Basque people highly value experiences in the world. They often spend several years in another country (sometimes as far as Japan, Korea, or Indonesia) working. There are settlements of Basque people in the USA, Argentina, Chile, Colombia, Venezuela, Mexico, the Philippines as well as others. But most people, after they have worked somewhere for a while, usually return home to raise their children. For them, their home town, their family, and their love for their language leads them to want to raise their children with their own heritage. This desire to pass on their heritage, and to return home, maybe, is the greatest mark of being Basque.